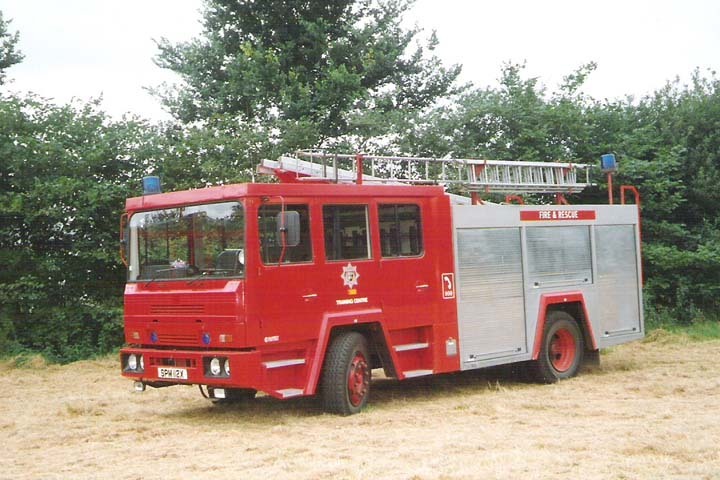 Surrey Fire Brigade 1980 Shelvoke&Drewry WrT. now been taken out of active service it was now(1992)being used by the Training Centre. Photo sent in due to a request,sorry though I've no operational history on this appliance. You made my day Pete, thanks for sending the picture in (I always used to look out for the Training Centre pair when visiting their Headquarters). Whilst I know they were criticised, I always felt at the time that these Shelvokes looked really modern, and due to their "boxey" appearance reminded me of the RS. In fact, I have often wondered which came first and whether Shelvoke & Drewery SPV were perhaps trying to cash in, by making an appliance reminiscent of Dennis's Ogle design or was it just what emerged? If it is the latter then (the benefits of safety aside) it's almost amusing to think that they came up with an equivalent look to what I imagine a highly expense crack design team did after much pencil chewing and pondering. Shame there are not more preserved ones still around. Added by John D on 12 January 2009.